My brain is tired; my mind has over-thought itself into possible oblivion. How do I know this? Well, for one I typed and deleted the non-word thinked in place of “thought” in the previous sentence at least twice just now. I did realize something wasn’t right with the sentence because I kept trying to justify the linguistic exactitude of the word by making up sentences with the past tense of think in them. I understand how anyone reading this may be appalled by this lack of basic grammatical knowledge, especially coming from someone who claims to have a slightly better than average understanding of the English language. But at this point of mental saturation, my brain (always thinking outside its little box, that little genius) offered me just that and another non-word, thunk. So you can see why I went with the less preposterous (but still offensive) thinked. I actually cursed the efficiency of MS Word’s spellcheck because they kept underlining my thinkeds in red, indicating a spelling error. They’re still doing it, but the difference between now and five minutes ago is that my ‘errors’ are deliberate. I could also tell you about the two separate occasions where I used be’d instead of was in a conversation but just in case any English school teachers are reading this post, I’m gonna spare you folks the coronary. In my absolutely poor-on-account-of–being-so-tired-I-can’t-think-straight-let-alone-smart defense, it’s 3.30 AM in the morning. The fact that the worst thing I’m doing right now is badly conjugating a verb should be of some comfort to you, O English school teacher brave enough to still be reading this eyesore of a post. I know of some kids who’re up to bigger acts of blasphemy, and who knows, you probably teach a couple of them! Okay, so, Confession Time. When I’d originally started off with that opening line about my mind currently is being in such a sorry state, I’d intended to steer it in the direction of the topic I really had in mind: how being smitten by someone can really mess with your head and turn into a schmaltzy slush. I know romanticism is a theme endemic to my blog, and everyone’s probably tired of reading the same old crap, but doesn’t it fascinate you that when you excessively like someone everything you do suddenly seems at the mercy of that person? I mean, it starts off with the songs you listen to. Suddenly you start hearing certain lyrics more distinctly than others. For example, “I’m so obsessed, my heart is bound to beat right out my untrimmed chest,” suddenly holds appeal to me, and not just because singing about chest hair cracks me up every time I do it. Then it’s the movies you watch. You begin relating situations in them to your own life, more specifically moments in your life involving that person. You know what I’m talking about. They’re mostly scenes in movies that make your heart sigh, but you’re too jaded to admit it. However, you know you’re really far gone when you are even able to relate to an action movie about a married couple who’re secretly assassins hired by competing agencies to kill each other. Either that, or your relationship with your person of interest obviously needs help. Mr. & Mr.s Smith: the picture of wedded bliss and charming domesticity. Doesn’t Jolie look hot in those red Wellies and Pitt look dashing in those boxers? If you’re recognizing the symptoms of mild obsession and are afraid, don’t be…yet. It’s only when you can distinguish said person’s laugh from everyone else’s in a fairly noisy classroom, or when you make a subconscious mental note of his/her facial expressions, or when the outcome of your entire day depends on whether the two of you engage in uh, casual…er, conversation (what did you think I was going to say, you dirty English school teacher?) or not, or when the only difference between your dreams and reality is the act of waking up, that’s how strongly your thoughts are laced with well, him, that you should be really, really afraid. 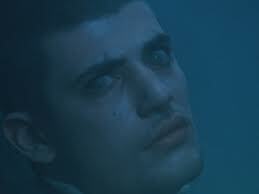 Here’s Victor Krum, looking at Hermione. The glazed over eyes indicate that he’s under the Imperius Curse. What did I tell ya? I mean, let’s face it: you might as well be under the Imperius Curse. This is not only awesome, it’s also very encouraging to a lazy amateur like me. Thank you, WordPress! I loved the fireworks! And the adorably presented stats! Black symbols in a white speech bubble, that was all they were. While her heart declared them to be seven shades of stupid. But I digress. The point is, as I was wallowing in self pity after beating myself up over my lack of assertiveness and the cojones to stand up for the things I really love to do, my sister provided the solution, simple and clear as day. I looked at her incredulously. It couldn’t be as simple as that. No, not after all these months of playing the confined rebel, the tortured artist, the unsung martyr of all wannabe-writers-who-get-steered-towards-the-more-science-related-profession-due-to-familial-pressure-and-etcetera. There had to be a catch. Sensing my disbelief, she tried another way to convince me. My ears pricked up at the word ‘challenge’. I love challenges. Challenges tend to be the perfect opportunity to prove people wrong, and nothing makes me happier than doing just that. “Every day for a week to begin with,” she continued, and when I had neither rejected nor accepted her challenge in the next minute she played her trump card. “I betcha you can’t do it anyway,” she said with a dismissive shrug, and proceeded to do whatever it was she’d been doing before I interrupted her. No? There’s no such saying? Well then, I guess I’m just going to have to patent it now. That’s when I gave in. “Fine. I’ll do it,” I sighed, and this is why here I am, writing a post about writing. Hah, it wasn’t intended to work out this neatly, but I technically just completed my criteria for Day 1 of the WAWC! Pfft, it’s not called cheating, alright? I was asked to be random. Expect another post tomorrow, non existent reader! The Oxford dictionary says that an emotion is either a strong feeling, such as joy or anger (really, Oxford, that’s the kind of definition more dictionaries ought to publish) or an instinctive feeling as distinguished from reasoning. Bingo. An emotion is approximately the opposite of logical reasoning. This word originates from the Latin word emovare which means ‘disturb’. So, in conclusion if you have ever experienced the annoying discomfort of being on the verge of taking a major decision that would in all likelihood do nothing but improve your life, and suddenly spot the emotional twist, say for example an ex-flame you’re not sure you’re really over, or an untrustworthy friend who you can’t help but love cause s/he’s just been around for too long or an overbearing parent who you just want to make happy (you get the point), and then out goes that sensible idea, you can proudly wear a Hello! 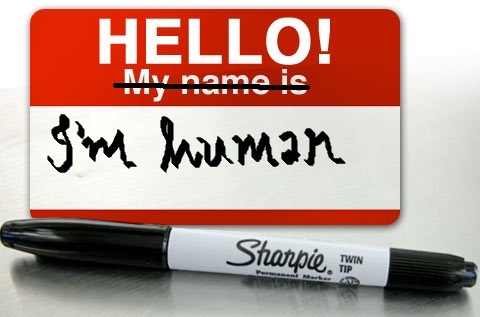 I’m Human sticker. Preferably on your forehead, where everyone can see it. Or maybe a Caution! 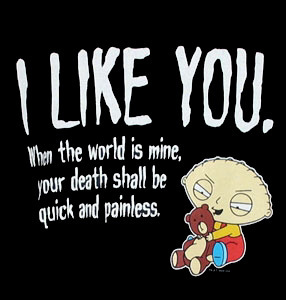 I’m Human sticker would work better, depending on just how disgustingly human you are. Presence of emotions should be classified as a form of retrogressive evolution. Not to be carried forward in the next generation. Maybe then the more competitive of our lot will buck up and make a bunch of stone-hearted, smart babies. On second thoughts, that might not be such a good idea. 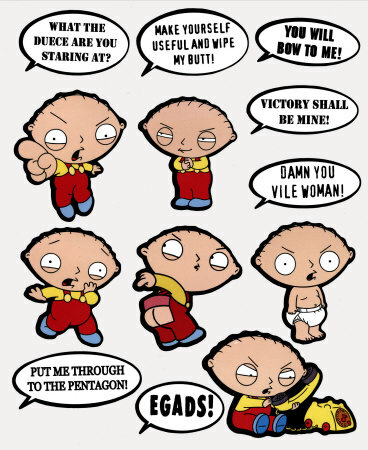 I just imagined a population explosion of Stewies and the mental image gave me the creeps. Back to the point. The reason why I’ve developed this sudden antipathy towards my kind is because I’ve developed a little crush, and that little crush has developed feelings of it’s own. The worst part is, it’s probably my fault. I fed that stupid crush of mine scraps and morsels of sentiment and pinches of idle daydreams that all began with “what if…” and now it’s grown into this monstrous entity that cannot be banished from my head. Believe me, I’ve tried. But it’s already taken control of my mind and obliterated all paths of rational thinking. Yup, it’s an emotion. And a big fat one at that. Into a place called Tomorrow. A conversation with a good friend of mine made me think about certain things…and see them a little differently. And well, some of it I was feeling already.. Yet why does it feel so right?